Solar-Tectic LLC is pleased to present “1c-Perovskite/Crystalline Silicon Thin-Film Tandem” a high efficiency solar cell with a non-toxic (Sn, Au, Ge) component replacing lead. A perovskite/crystalline silicon thin-film tandem solar cell can potentially reach efficiencies up to 45% ! 25% – 30% is a realistic goal for now. Update (January 21, 2019): ST is excited to learn that Brown University’s Padture group has demonstrated stable perovskite material patented by ST. See their paper in the link (https://www.nature.com/articles/s41467-018-07951-y) and the ST patent [link — see attached] with the same material system. Update (September 4th, 2018): Solar-Tectic is pleased to announce that another breakthrough perovskite patent has now been issued. Please see the related news post for more information. Update (May 29th, 2018): Solar-Tectic is very pleased to announce that yet a fourth patent for perovskite solar cells was allowed today by the US Patent Office. US patent application 15/157,539 titled “Methods of growing heteroepitaxial single crystal or large grained semiconductor films and devices thereon” covers every type of perovskite as a top layer in a high efficiency heterojunction solar cell device. This achievement greatly enhances Solar-Tectic’s patent portfolio. 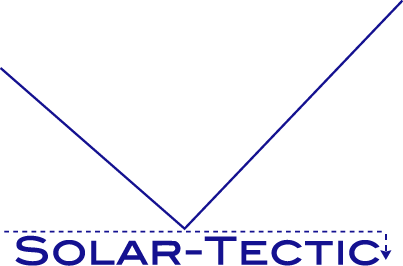 Solar-Tectic is one of only two companies in the USA working on perovskite solar cells, and perhaps the only one with issued patents for perovskites. Update (April 17th, 2018): Another patent application for perovskite solar cells was allowed by the US Patent Office today. Please see details under News. Update (February 5th, 2018): The perovskite CsSnI3 (cesium tin iodide), which is non-toxic, has successfully been grown on our MgO (111) highly textured transparent buffer layer, on soda-lime glass. Now we will move to the tandem fabrication, stability testing, and then solar cell…. Update (March 27th, 2017): Tin perovskite thin film tandem solar cell patent granted by the US Patent Office to Solar-Tectic LLC. More info available through PRNewswire. Update (November 3rd, 2016): A patent for Tin Perovskite/Silicon Thin-Film Tandem Solar Cells has been published today, the patent can be downloaded through this link. Update (September 9th, 2016): A PDF Version of the Patent Application for Methods of Growing Heteroepitaxial Single Crystal or Large Grained Semiconductor Films and Devices Thereon is now available.